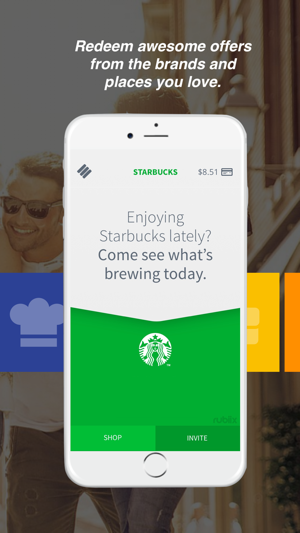 Rubiix is the social spending app that connects you with your favorite brands. 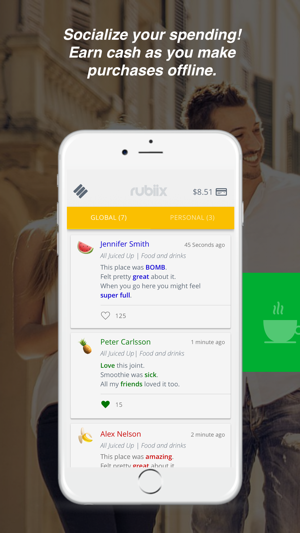 Participate in the Rubiix community by sharing reviews about your recent purchases, and receive the most targeted offers from your favorite brands. Get cash back when purchasing through Rubiix and claim your share of ad revenue! Securely link Rubiix to your credit or debit card via your online banking. As you shop you’ll start receiving offers and content from your favorite brands and places. You can review your purchases and share your experiences with the Rubiix community by writing Rubiix Reviews. Earn cash for engaging with brands, writing helpful reviews and for purchasing through targeted offers from Rubiix. You’ll get cash delivered directly to your PayPal or bank account. Yes! Rubiix links securely with your online banking with bank-level security and encrypted connection. Yup! It's actual cash that you can spend anywhere. It builds up and accumulates over time. No strings attached. Cash out any time and get your money directly to your Bank Account or PayPal. 1. Install the Rubiix app and securely link to your credit card or debit card via your existing online banking. It only takes a minute. 2. Start earning actual cash that you can spend anywhere, for helping our community, our brands and for purchasing through our cashback offers. 3. Cash out to your Bank Account or PayPal. When you engage with your favorite brands, we EMPOWER you as the consumer and allow you to capture some of the billions of ad dollars spent in the market today. •	Rubiix links directly to your online banking using bank-level security and encryption. •	We’re here for YOU. If you have any questions, just ask! Nice app, super easy to sign up and right when you do you already earn a dollar, and it’s not a scam either you actually earn money just barely any... it’s usually around like 5 cents... but I mean hey you aren’t doing anything at all so just let this thing sit on your phone for a while and you could collect a few bucks every now and then. I love love love the cash out feature though. This is the only app that I’ve seen that lets you cash out at any price you want... so even if you have a penny in your account on the app you can cash that penny to your bank account in like 2 seconds... super fast and easy... other apps you have to wait till you get like 5$ or something but this app lets you do it at any price, now for the reason why I rated it 3 stars is I would add a way you can watch videos/adds or comeplete surveys to get straight cash. If you can have it where you watch a video or something and you get straight cash from it.. this app would be huge... I’m tired of all those apps that have points where your never able to cash out... and another suggestion would be to add a little more cash from these “cubes” that you get.. it’s like 5 cents which is not much at all but overall really impressed... love the layout, good job guys! The amount of money is not a lot at all, however you do nothing for it so i believe it is worth it. The customers service is amazing! They get back to me within 10 minutes of my email, they are nice and polite and are willing to help you in any way that they can. Really enjoy this app! Very easy to understand and the money getting in to your account happens rather quickly. There is no minimum payout! You can send the money right into your account or PayPal if you want. Overall great app. So I just started this app today so my review is not an experienced one. Signup was easy, as they let me link through the Facebook app. Then the app asked for the sign on to my credit card, okay. Done. Paid me $0.99 for registering and claims to be delivering more with the use of my credit card, all a very positive experience so far. Stay tuned, will update when I have more experience with the app and how it works. Thanks so much! We're so glad you're loving Rubiix!